Golf is all about focus, concentration, and control. It seems like you are learning a foreign language at first, I believe every golfer has had the same feeling at their early stage of learning. So you can easily imagine how it might feel to a kid who is just started learning golf playing. But another fact says children learn faster than the adults does. So, it is probably the best time if you take your children to attend golf lessons at their early age if you wish to see them as a golfer in future. Young kids can get enough matured to play golf as soon as they reach at their 5. To avoid unnecessary frustrations, we can find the right equipment for them. At first, when your child just tries to figure out if he likes this sport in particular, we would recommend not to spend much on golfing equipment. But, as soon as you realize that your child has some talent in golf, you should take a look at this article because it’s IMPORTANT to choose the right equipment, primarily to select the best golf club for kids. To learn how vital role a junior golf clubs set can play when it comes to your children learning golf. We reviewed 10 best golf clubs for kids to make it easier for you to determine the criteria to choose between them. If you have kids who love golf, it’s the perfect time for your child to spend a wonderful time outdoors with the best set of starter Gold Club. The Confidence Junior Golf Club Set is made taking into account children will regularly use clubs. The Confidence junior golf clubs contains lofted hybrid iron material that helps to generate an appropriate flight and result into a superior trajectory with the flight. With this set of junior golf clubs, your child can learn and aspire to achieve the magnificence of golf within no time. There are two sizes available of this youth golf clubs set: one for children between 4 and 7 years, and the other size works best with the children between 8 and 12 years old. This set of children’s golf clubs contains four clubs. A wood, two iron and a putter where all of these four are made excellently. The iron has a low center of gravity as well which makes the golf game fun for the children in the first place. The bag is resistant with a double shoulder strap. The clubs are enclosed well and weigh very light which is an essential feature for children’s golf club. Moreover, these toddler golf clubs are tough which is necessary for children’s regular use. The Confidence youth golf club set with the stand bag makes great starter golf set for children who. The set comes at a very affordable price so it won’t be a tough decision if you want to give it a try. You can choose the right or left version as both are available. The golf clubs are made of hybrids, irons, and fairway woods. The putter in this set allows your children to get more precise shots. The set will meet the versatile need of your junior golfer. A little heavier for kids. A little hassle to fit it properly. Final Verdict: Your kids can move with the whole sandbag without trouble because the bag can be converted into a backpack using its shoulder straps. It’s a total package for your golfing kiddos to have. Want to surprise your sporty kids with something interesting? Then buying them a Callaway XJ Hot Junior Golf Clubs’ set might be the best thing you can do. Callaway’s golf clubs for adults has already captured a remarkable reputation in the market, so taking a leap of faith for their children’s golf clubs might not be that risky as well. One of the best features about this youth golf club set is that it is designed both for boys and girls, rather than the latter barely being just an afterthought in some cases. So, you can buy this both for your female and male kids. It also addresses two different age groups; the toddler golf clubs are for children between 5 and 8 years and the youth golf clubs for children between 8 and 12 years. Thus Callaway XJ Hot Junior Golf Clubs are reaching for a wide range of young players. All of the seven junior golf clubs in the set come with an overriding theme which resembles the exceptional performance they offer. The pick of the set is the driver providing a reasonable distance off the tee and consistency as well. The two-ball Odyssey putter in this set will help you rock-star kids simplify the art of putting with a right balance and correct ball alignment. Both hybrid and cavity-back irons are very tolerant. The classic Odyssey putter fits well in any golf bag. Kids these days need more and more of physical activities, and golfing is one of those few games that allow your children are enjoying their pastime while promoting their physical and mental development. Exercise N Play Deluxe toddler golf clubs set thus ensures a safe golfing excellent materials that provides your children don’t have significant accidents or injuries. The Exercise and Play Deluxe toddler golf clubs have been designed especially for the toddlers to make sure that they do not get a fatal injury while practicing with their tiny precious hands and legs. If you have been thinking of it for a long time and couldn’t find which games and which gaming equipment would be the best golf clubs for kids, then you should definitely give it a try. This toddler golf clubs set comes with a carry bag that contains three different kinds of golf clubs, two different height ball tees, five white gold balls and practice holes with flags of various colors. All of this equipment is made out of durable and good quality plastic. You can keep calm and watch your kiddos playing with Exercise N Play Delux toddler golf clubs without getting hit by a club or nailed by a ball. Because all of the items included in this set are child safe and parent approved. Includes balls, tees, clubs, and holes with flags. Clubs has two separate par. Final Verdict: Parents, no more worries about your kids of getting hurt or injured as long as your kids have a set of Exercise and Play golf clubs set for kids. This new set of toddler golf clubs is built with solid stainless steel heads to carry with the wear and tear while used by the kids and still help to keep them new and fresh even after extended use. PowerBilt’s new golf clubs set for junior include hybrid long iron. These long, easy-to-hit iron alternatives have become very common among adult games that makes sure of it will undoubtedly improve your kids’ golfing as well. The PowerBillt is one of the fast-rising brands for golf clubs set specially designed for the toddlers. They have created their golf clubs with an exciting design that matches with kids’ golf bag. The set includes an extra-large driver at 320cc that allows greater distance in the ball flight. It also has a putter in the bag which can be used both for practice sessions as well as for serious gaming. To power up your kid’s style, PowerBilt also features a matching head-cover. Each of these toddler golf clubs is guaranteed of its quality, size, and weight for a toddler aged between 3 to 5 years. The clubs of the set are constructed with ultra-strong and lightweight graphite making it strong yet light, perfect golf clubs for kids. Set consists of 5 children golf clubs including one driver and one putter. Trendy looking, self-standing golf bag. The set can be ordered for right or left versions. Bag color might be random. Final Verdict: The PowerBilt got very popular with the unique and trendy looks of their youth golf clubs and the bag. If you are one of those cool parents, then get your kids these stylish looking golf club set and don’t forget to capture the smile on their faces. The Little Tikes Totsports Easy Hit children’s golf clubs set is a little bit different from their grab and go. The Easy Hit is specially designed for very young children, aged between 1 to 6 years. Little Tikes’ Totsports easy his is the best buy for the new-walking babies because it helps their psychomotor skills without even knowing. The golf bag of this set is more likely to a wheeled cart and comes with an instrument which can help your babies to hold on and initiate their first steps proficiently. The wheels take turn easily and effortlessly and make your babies’ mobility better and faster. Buy your kids a set of Totsports Easy Hit at their very young age and see how they get set at your backyard and start playing like a baby pro. The Easy Hit helps your kids’ visual motor coordination as well as develop their spatial awareness and reasoning. For example, whenever your babies are playing golf, they do not just enjoy hitting the ball with the club, they also start to think analytically how far they should target and how much force they need to put to their drives to get the ball right into the putting holes. The set consists of one golf club, one putter and 3 golf balls making it a perfect children golf set to get started with. Includes three golf balls, one club, and one putter. Need to be fully assembled. Final Verdict: If you have been thinking whether to get your kids a golf set at a really young age, then leave worrying about that and get them a set of Totsports Easy Hit to play this fun game with ease while developing their motor coordination at the same time. Children, especially aged between 3 to 5 years, are becoming more active than any other age groups. They always keep themselves busy exploring this or that all the time. And thus, this is the best time for getting them a paragon rising star children’s golf club set. Primarily it might seem counterproductive to you to throw this challenge to your delicate little kids. But trust me, this is the best time for them to explore the fun of golf and improve their intelligence with good physical health. If you intend to channel all the negative vibes from your kids, then it might be the best idea to get them involved in something more constructive like golfing. Keeping continuous focus on the ball set on the tee can improve your kids to concentrate better and get their minds off of all the negative things going around them. Paragon toddler golf set is precisely what you need for your little children. Especially if your children show interest in sports at their early age, all you need is to get them a set of Paragon junior golf club set since the whole package comes complete with everything your baby boy or girl would need ever. Just don’t forget to support and cheer for them in their interest. The paragon junior golf set is a complete package itself since it has a lofted fairway wood with a head-cover. The iron in this set comes an oversized and full sole whereas the putter of this golf club set has been designed like a mallet which increases the possibilities of hitting the ball right every time. This will keep your child motivated as well. The extra-long driver is constructed from sturdy titanium matrix which boosts the chances of making a perfect swing. The irons are made of high-quality, durable stainless steel which makes it a superior low center of gravity. The shafts have been made of premium graphite providing a firm hold and ever-lasting durability. The kid golf bag comes with this set is something that your kids are going to love. Comes with a great looking golf bag that would help to get the set organized and carry comfortably. Available for both left and right handed golfers. Final Verdict: Paragon junior golf club set is a complete package for your children. The quality and design perfectly match with the children’s requirement. You might want to give it a try at least for once. Wilson’s junior golf set is the perfect choice for the young beginners. Combining functionality, quality, and versatility at a reasonable price within just one set, Wilson brings the best combo available in the market for those who are looking for the best affordable golf club set for kids. This youth golf club set is available for both left and right-hand types for the following age group of children: 5-8 years (red), 8-11 years (yellow) and 11-14 years (blue). One note here, left-handed golfers’ clubs can be found in Blue only (11-14 years). The kids’ golf club set for 5 to 8 years kids includes 6 pieces in total, the set for 8 to 11 years consists of 8 pieces, and golf set for 11 to 14 comes with 9 pieces. All golf sets here commonly include a driver, a wedge, a short iron, a putter, a stand bag and headcovers. Golf set for 8 to 11 years and 11 to 14 years include a hybrid club in addition. For new players, cavity back irons are very useful (for all players, in fact) because they have a larger circumference weight on the head, so they provide more forgiveness in mishit shots. The blade putter is not as tolerant as the mallet style, which may cause some subtle problems on the green, but it still holds strong. Each set comes with head-covers and a lightweight stand bag specially designed for kids. Too much flex on the club shafts. Final Verdict: The lightweight carrier bag features many zip pockets and a comfortable dual-strap carrying system for easy walking. Wilson is famous for producing quality complete golf sets for adults. Now they have also launched some of the best golf clubs for children as well. So, you can give it a try without a doubt! Young Gun Zaap Eagle Junior Club is a perfect starting package for a novice golf player and which also comes at an excellent price. There are games designed for four different age groups: Green (in the picture) for 12-14 years, Red for 9-11 years, Blue 6-8 years, and Yellow 3-5 years. Both age groups are only available in the right clubs, so if you are left-handed, you have to look elsewhere. But now let’s take a look at why this junior golf clubs set is in our top 10 list itself. Each golf set for every age group includes a 3 wood, 7 iron along with a forgiving semi-mallet putter. All of these pieces are kept at a shorter size than the adult-sized golf clubs. Both wood and iron are made of graphite which makes them super-light. With the shafts of graphite and large club-faces, they are so easier for kids to hit. Comes with a single-strap bag with enough storage and pockets. Final Verdict: This youth golf clubs set comes with an excellent bag containing a few pockets and a single belt for easy transportation. So, you can give it a try if you are looking for a lightweight set for your kids. American Plastic Toys Junior Pro Girl’s Golf Set got ranked seventh in the category of best golf clubs for children and toys out of total 84 Toys & Child Golf Clubs found across the world. American Plastic Toys Junior Pro Girl’s Golf Set has not enough reviews to judge yet. The general sentiment of the American Plastic Toys Junior Pro Girl’s Golf Set customers is 41% better than the average satisfaction sentiment of Toys & Child Golf Clubs consumers. Includes 2 clubs, 4 balls, 2 flags, 2 rings, and 1 tee. Comes with a beautiful stand bag with wheels. The plastic needs to snip off. Final Verdict: 90% of customers of this fantastic, girly golf set would most probably recommend this to their friends to purchase it, or maybe others got inspired by its look and made a purchase for their baby girl golfers. If you have a sports-loving baby girl, this is a must for her next birthday gift! The Intech Lancer Junior golf set offers lots of equipment at a good bargain. The complete junior golf clubs set includes a high driver with high loft (18 degrees), 4/5 hybrids (24 degrees), 7 and 9 irons along with a putter with mallet style. The kit also includes a lightweight dual-belt stand bag and has a 4 ways top divider. It also offers you head-covers for the driver and the hybrid. All the clubs in this set has been designed with higher lofts to provide your juniors a better starting which is often found difficult for the new golfers. The cavity back irons offer more forgiveness, and the mallet-style putter helps to get correct alignment and stability in golfing. Each club of this set has a lightweight and flexible graphite shaft while the mallet putter has a steel shaft. Suitable for young and new players. Stand bag with 4-way divider top and double strap for smooth movement. Some users faced issues like breaking or denting clubs. Final Verdict: The Intech Lancer junior golf clubs set is an excellent choice for whom who looking for a cheap yet good quality golf are set. Otherwise, it is not recommended. Why should I encourage my children to play golf? Golfing helps not only physical mobility and motor coordination in your kid’s hands and legs only. It also improves their mind to get more focused and their optical motor system better than any other sports. At the same time, golf increases their analytical ability by making them think rationally and make the real assumption of distance and strength and keep it at a balance. What is the appropriate place to teach a kid how to play golf? This actually depends on your personal preference. As soon as your kids are done with practicing at home or backyard, try to take them to either a golf course or a driving range for their better practice. What is the ideal age of a kid to be taken to the golf course or the driving range? If you are a golfer yourself and your children show any interest for golf watching you playing, then the most appropriate time to encourage your babies by taking them to the golf course with you at their age of 3. When they grow up a little older as long as 5 years old, you can start their lessons with physical involvement. Are there any chances of injury while playing golf? Golf may seem quite a safe game as the chances of trampling on a golf club is much less than that you get in football, running or jumping. Yet, there are still chances of injuries that can happen to your kids while playing golfs and when it happens, it happens dangerously. The most reported injuries are back pains and wrist strain. So, make sure that your kids are getting their lesson with care. Is the appropriate golf equipment necessary for a kid to have to get started playing golf? Yes, it is essential for your children to have golf clubs which have been designed for kids. Because junior golf clubs are manufactured with the right length and weight for the kids which plays a critical role when your kids are trying to get perfect swings comfortably. That century had gone when young kids who had the love for golf playing, had to play with adult clubs which are cut down to their size. This is the time for kids now to have their own version of golf clubs with perfect size. It is okay for very young children getting started with a putter and a cut down 7-iron, but when the children grow up, they need a set of golf clubs that are created with their body structure in mind. Today, there is a good number of manufacturers who produce youth golf clubs set. But with different types of clubs to choose from, there are some things you should keep in mind when purchasing a golf club set for kids. Length should be the first consideration since, the trick for finding a mini golf club game that is the correct length for the golfer. Remember that it doesn’t matter if your junior is choking down on the clubs several times. You won’t want your children to move their hands down for the grip repeatedly. Will you! The foremost rule is: if the child chokes down more than 1.5-2 inches, it’s way too much for him or her. 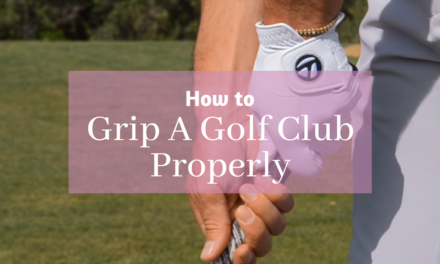 Choking down to get the grip for more than 2 inches can change the whole swing, requiring that they manipulate the swing so that the club is around their bodies. If it takes your kids to drop down only 1 inch for the grip, then they can expect a perfect swing at the golf ball. The second consideration should be shaft flex. The vital problem with a cut-down junior club is the stiffness of the shafts. When it takes 4-5 inches from the length of the golf club, it makes the shaft very rigid. This explains the inability of young people who use cut down clubs in their shots. A good thing with the new golf sets is that manufacturers are now constructing shafts that are the appropriate flex for swing speeds of children. The use of light steel and graphite makes golf clubs for young people more playable. Today’s youth club auctions are so flexible that they can be folded by hand. So check to make sure your child’s club set has a nice and flexible shaft. The weight of the golf club is also very important for young golfers. If the club is too heavy, the child will have difficulty moving the club to the top of their back. The fight to restore the club caused manipulation in the swing that leads to a contradiction. The lighter club will help the little golfer get to the right place at the top of the swing and take him to the easily replicable alternative. As with the flexible shaft, most club manufacturers create young clubs with lighter heads and shafts. So, before buying, be sure to check the weight of the clubs. You want clubs to be light enough to adjust to your child’s age. The last consideration is the size of the grip. Considering it important to check for the grip of youth golf clubs is a new idea in recent years. In the past, the clubs were cut down to the perfect size, and any grip that would fit on the shaft were applied. But bigger grips cause the same problems for the little golfers as they do for adults. If the grip is like a baseball bat, the swing mechanisms will change. So, when buying a golf club for kids, make sure that they fit for the young people. If you change the grip, ask for a small sized grip with a core size of 0.50. These smaller grips will make a visible difference in your child’s game. As adults, we realize how hard golfing can sometimes be and how appropriate equipment can help our performance. With these considerations in mind when purchasing junior golf clubs, you can improve your children play better in the golf game and, most importantly, enjoy their time spent on the golf course. Download The Ultimate Guide to Perfect Your Golf Swing! We have compiled an ultimate guide to help you improve your golf swing with both drivers and irons. Download the guide to get a detailed insight into how certain shots work and what you need to do.